Shiriba Lodge - Champagne Valley Accommodation. 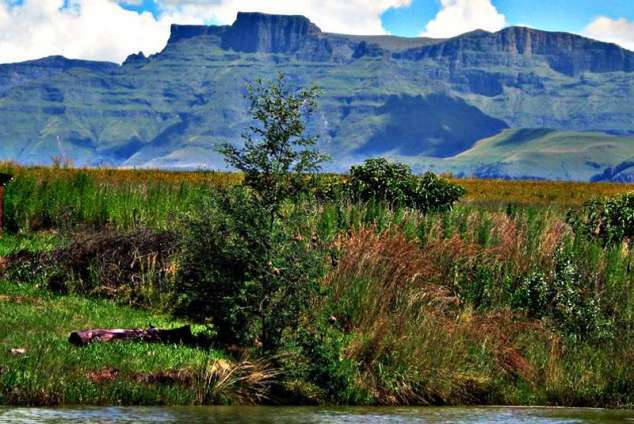 Situated in the Central Drakensberg World Heritage zone, Shiriba farm is a 50 acre, privately owned property in the heart of the Champagne Valley. It's a dream in the making. A few years ago we decided to downscale and move to the country to live a simpler life. Being eco-friendly and self sufficient is our primary objective. Honeystone Cottage is a romantic hideaway for two which is private and secluded with views of the Berg as well as a dam teaming with birdlife. It comprises of a quaint stone and thatch double storey build - perfect for those who want to escape to the quietness of nature for awhile. Upstairs the spacious bedroom offers a deliciously comfortable kingsize bed or optional two single beds and flaunts lovely views of the mountains, surrounding countryside and dam. Downstairs this self catering unit offers a fully equipped open plan kitchen with gas/electric stove and a fridge freezer large enough for those extra supplies. The kitchen opens to the lounge dining area which boasts a cosy fireplace for the cool winter nights. A well appointed modern bathroom has both bath and shower. From ground level, double doors open out to the garden, braai and splash pool. The wooden deck invites you for sundowners whilst the evening dam-life puts on the entertainment. There is a canoe available for those who want to get closer to the action. A shaded carport solves the sun and hail challenges. Included in the inventory are the following: Linen (including towels and swimming towels), microwave, oil heater, mosquito net, overhead fan and extra blankets. A range of incidentals is also included. Ice in the freezer, hair dryer, umbrella, torch, a safe for valuables and a basket of wood. Extra wood is available for sale at the main house. A midweek service and linen change is provided. Regret no children unless by prior arrangement. No pets. Cedarwood Supermarket and Liquor Store is situated across the road from Champagne Sports Resort; alternatively Winterton is about 22km away. Petrol is available at Champagne Sports and Dragons Peak. Golf - 18 holes at Champagne Sports Resort (rated in top 30 by Complete Golfer) and 9 holes at Monks Cowl. Walks to Bushman Paintings and numerous hiking routes. Bellpark Dam or Spionkop Dam Nature reserve with picnic spots and game viewing. Clay Pigeon Shooting, River Rafting and Quad Biking. 60447 page views since 14 Nov, 2007. Last updated on 12 Feb, 2019.